Candice Olson + Blik = FABULOUS! Anyone who knows me well knows that I adore Candice Olson of HGTV’s Divine Design. In my humble opinion, she’s absolutely the most brilliant interior designer in North America today. Because of my slight obsession with Candice Olson, Home Magazine is one of my favorite magazines because they always feature her latest project. I was over at the Home Magazine website looking at the photos of the latest Olson project they featured, and once again, it doesn’t disappoint. It’s an attic-turned-living room, and it’s absolutely stunning. This entire room is fabulous, but did you happen to notice the walls? Yep, she used wall decals! I generally think of wall decals as something to use in a child’s room, or in a “young” room, but she proves that you can use wall decals in an adult, sophisticated space, and they look great! These wall decals are from a company called Blik. Their website is packed FULL of great decals that come in MANY great colors. 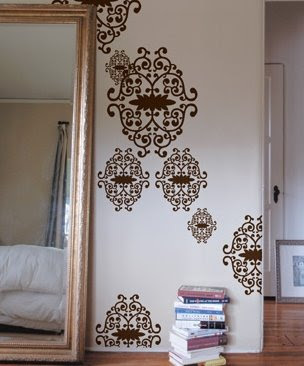 This is the paisley decal used in the Candice Olson room above, but just in a different color. 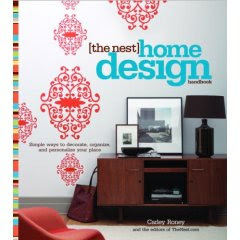 The blik Iron Vines decal is featured on the front cover of The Nest Home Design Handbook (which is a great book, by the way). 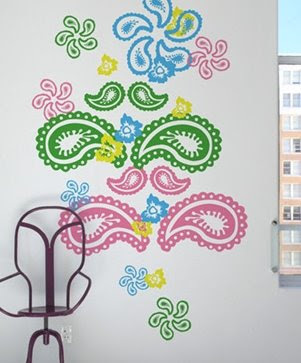 You can visit the Blik website to see more great wall decal designs. Happy decorating! Previous Post Have You Seen Where I Work? I love Candice Olsen but often miss her show. Thanks for the eye candy. I love those wall decals! 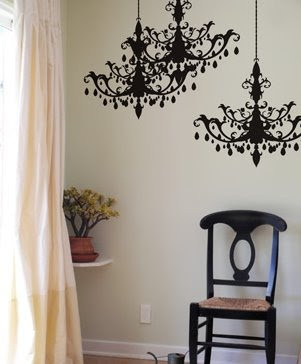 How fun to use one of those big chandelier decals in the most uncommon of places, huh? Sandra, I saw one of the chandelier decals used in an ADORABLE baby girl’s nursery the other day. I wish now I could remember where it saw that. These decals could definitely be used in some pretty inventive ways. My mind is running wild with various ideas now. Those are really cool but I don’t think I could ever pull it off. I agree with you whole heartedly about Candice. I would feel completely comfortable giving her carte blanche in my home. Thanks for sharing this pretty room. Great!! You have made this house to look so beautiful. Wow!!! So fab and chic. 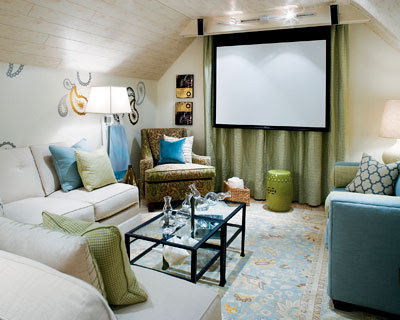 What an attic…what great design style. Props goes to Candice. I love large attics. I just got done emptying my parents stuff out of the attic. It was filled with a lot of memories, and antiques. This is actually an office and screening studio for a film maker, but yes, Candice is brilliant. You have great taste and talent yourself. I’m sure the article said exactly what the room was used for, but I didn’t read it. I just couldn’t stop staring at those beautiful pictures! I notice that she hasn’t had her wedding ring on in recent episodes. Is she still married? Interesting observation, anon! I don’t have HGTV, so I don’t get to watch the new episodes. I haven’t noticed that. Candice Olsen is by far my all time favor-i-t-e designer! Kudos to you Candice, and if you’re EVER in Kentucky I would be honored to have you work your “magic” in one of my rooms! I LOVE YOUR DESIGN CANDICE YOU ARE #1 DESIGNER . I came here as a refugee from Africa. I bought a home in Hamilton, NJ and my wife and I decided that in order for our life time dream to come true, no matter how long it takes, we MUST get Candice to visit us. I am even thinking about going to Canada to find her. WE LOVE YOU and your team Candice. Please if any of you know how we can get in contact with her, email [email protected]. Thanks. Candice is absolutely the BEST!!!!! So is she still married or not? I also noticed she is not wearing a ring. I like this website I feel that this site could be very useful . what a great wall decors it gives an additional beauty to become more attractive….i love it.